David Gonzales and the male nurse (who's name I cannot remember) who attended to me were very professional and very welcoming...I highly recommend this practice to others. David Gonzales and the male nurse (who's name I cannot remember) who attended to me were very professional and very welcoming... I highly recommend this practice to others. 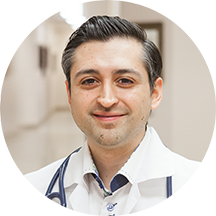 Dr. David Ramos is a primary care doctor treating patients in San Antonio, Texas, and the surrounding communities. His primary goal as a practitioner is to ensure that each of his patients receives the highest available standard of medical care. He holds certification from the American Board of Family Medicine. Dr. Ramos is also a member of professional organizations including the American Academy of Family Physicians, the Texas Academy of Family Physicians, and the Texas Medical Association. For his undergraduate degree, Dr. Ramos attended St. Mary’s University. He pursued his medical degree at Ross University. Dr. Ramos continued his medical education at the University of Texas, where he received his residency training. Patients visiting Dr. Ramos can receive a full range of medical services. He provides annual physical examinations, cardiovascular screening visits, prescriptions, flu shots, general consultations, and checkups prior to surgery or travel. When he is not treating patients, Dr. Ramos enjoys exercise, soccer, and spending time with family and friends. Actually went in early. I was seen right away. Excellent service. I was seen by Betty Ramos, she was very knowledgeable and she made me feel welcomed as a new patient. Great staff, everyone was very attentive and professional. Treated me great! Tiffany the nurse was real sweet, she had to give mr 2 shots, which of course I don't like shots but she has a real good hand at putting shots one I didn't even feel the other wellit did hurt but it wasn't her it was the medicine going in, Ouch! The PA Ms Carrasco was great, very explicit with my diagnostic, look forward to going back next month! Very kind and very patient, he answered all of my questions thoroughly and showed a great amount of care. I highly recommend this office. His staff is super friendly and attentive!! I didn’t see Dr. Ramos...and I felt rushed. Went in for a routine physical...not sure if she did everything she should have. Seemed very concerned about my concerns and listened. Did not just rush me along will return for blood work to begin more in depth research. Highly recommended!! For a new patient appointment, the wait was super short. The office is very comfortable and the staff was so friendly! Dr. Ramos and his staff were super friendly and helpful! There wasn't a long wait time and the waiting room was really clean and spacious. I definitely plan on going back there for any future medical- related needs. This was my first visit. I did not have to wait long and was given ample time to express my reason for visit and health history. The PA was nice and treated me based on my symptoms. Staff was friendly as well. Dr.Ramos was really nice. He sat and listened to our issues and also the allergist julie Herrera was great as well. Every one was really very nice and also the nogalitos office was clean and well maintained! This will be our new Dr yay! I arrived at my appointment to find out that ZocDoc did not re-schedule me. I even received email and text messages reminding me of my appointment with Dr Ramos. Fortunately for me, he has a TRULY professional and kind staff. Theysqueezed me into his schedule. They may the whole process very effortless. I am extremely scared of getting my blood drawn. The nurse was ABSOLUTELY phenomenal. So thank you EVERYONE, I really appreciate such a smooth visit. Just what we were hoping for in a doctor! We have been trying to use dietary changes as an aid to better health, and Dr. Ramos is supporting that effort and giving us concrete tools. Excellent. He took the time to listen and didn't make a diagnosis until getting lab results. Office very clean and staff friendly. Honestly one of the best kindest doctors I've ever been to. Listens to your concerns. Awesome! Seems like a pretty cool guy. Even had a minor procedure done on site. Everyone is helpful and very friendly. Dr. Ramos is great and he understood what was happening, even tried out a few test just to make sure I'm healthy when I told them of my stomach problem. So far so good. I was very happy with the way the doctor addressed all my concerns. Honestly he seems to be an honest doctor that truly cares, not just a pill pushher, I'm glad! Very caring and attentive! He provided excellent medical care to me! He was real blunt and had a lot of valuable information to give. Kind and informative, will continue with Dr Ramos as my primary care doctor. I had a great experience. He was very helpful and genuine. One of the things that I appreciated about Dr. Ramos is he didn't rush me through my appointment. I know that we all have been to that doctor who is in the room less than 5 minutes and just cannot seemto leave fast enough. I felt that Dr. Ramos was genuinely interested in what I had to say and I wasn't just "another patient". I would highly recommend Dr. Ramos for anyone looking for a PCP. Loved Dr Ramos, he was very attentive and listened to all my concerns. He did not rush and spend the the time I needed to address all my concerns. Highly recommend him and will sure he is our family's Doctor. Very professional and really shows that he cares about your health. Dr. Ramos and his staff made my first visit with them very comfortable. Wait time was good and they were able to pull up my ZocDoc info so there was minimal paperwork to fill out when I got there. It wasalso great to get a same day appointment and they seem like they really care about getting it right. Great office! Appointment times are always available and the staff is so friendly and accommodating. He was kind. Friendly. Honest. Down to earth. He didn't push surgery. Offered alternatives... The office was really cold though! It was a good visit. First visit went very well. Definitely the best service I have experienced in a long time and I have had 5 Dr. appt's in 6 weeks. Looking forward to getting the medical care that I need. Dr. Ramos was very professional. He listened to my health concerns and promptly diagnosed and took steps to treat my health issues.